creating music for ancient Sanskrit chants while still maintaining the tremendous integrity and purity of them was a welcome challenge that Geroge Harrison and Ravi Shankar undertook with great care and deliberation. Recorded over 3 sessions two in madras, India and one in London the music was composed by Ravi Shankar and Produced by Geroge Harrison. under the auspices of the Material world Charitable foundation Geroge Harrison invited Ravi Shankar and 17 Indian classical musicians to London to record an album. This troupe then toured culminating in a show at London’s Royal Albert Hall. Composed by Ravi Shankar and recorded during five weeks in 1974 this album was produced in the studio by George Harrison. 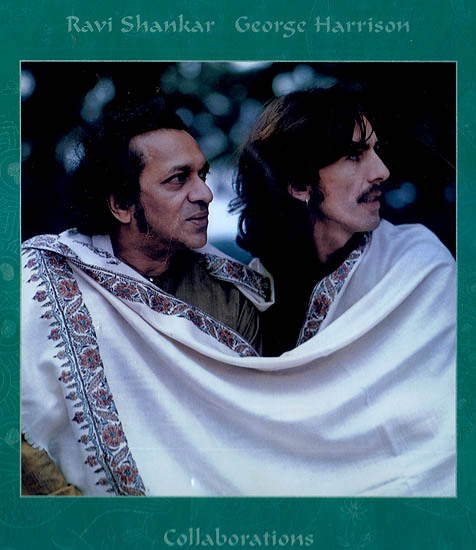 The first joint recording project between George Harrison and Ravi Shankar, Shankar Family & Friends brought together Indian classical musicians and western rock and Jazz Musician. Composed by Ravi Shankar and Produced by Geroge Harrison one Half of the album comprises instrumentals and songs while the second half is a thematic ballet to a yet un-staged performance.